BentoLunch.net - What's for lunch at our house: Star Wars Bento - May the Fourth Be With You! Star Wars Bento - May the Fourth Be With You! It's Star Wars Day, yay! Well, OK, this is mostly for my son and my husband, as my interest in Star Wars is only as far as it entertains Ben. I try, but I'm just not a big science fiction fan. I do find the Ewoks rather adorable, and Yoda amuses me. But Ben was up for something different, we made Yoda last year, and we've got R2D2 for my boy. Ben has a turkey and cheese sandwich, topped with an R2D2. He is cut with the Williams Sonoma cookie cutters for the shape, then I used food coloring markers to lightly scribble over the indentations so that I was left with a nice blue imprint, his name is also cut from some new letter cutters I got for me at Williams Sonoma. To go with this, he had carrots, yogurt with sprinkles and strawberries. We were going to make Star Wars cookies, but our sugar cookie batch was a disaster (did not roll or cut, so I just gave up, rolled them in balls and we had round cookies). We may still make some this weekend with a better recipe. Lunch is packed in our Easy Lunchboxes (also available on Amazon). 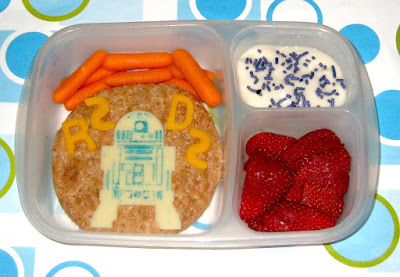 And a fun day like Star Wars Day couldn't be complete without a bento blog hop! HOw Fun!!! R2D2 was always my favorite!!! Love it Shannon! Great job on R2D2!! I seriously can't get over the detail on R2D2! GREAT job! Excellent job on R2D2, love it!! Your cheese R2 came out so well, bravo!